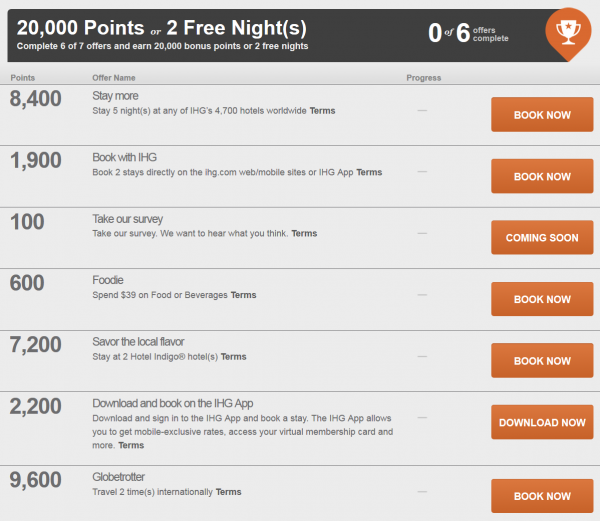 IHG Rewards Club has now enabled the registration for it’s “Into The Nights” promotion that is valid for stays between September 4 and December 31, 2014. Exactly like the previous two Big Win-promotions, IHG has a personalized offer for your account based on your previous stay history. 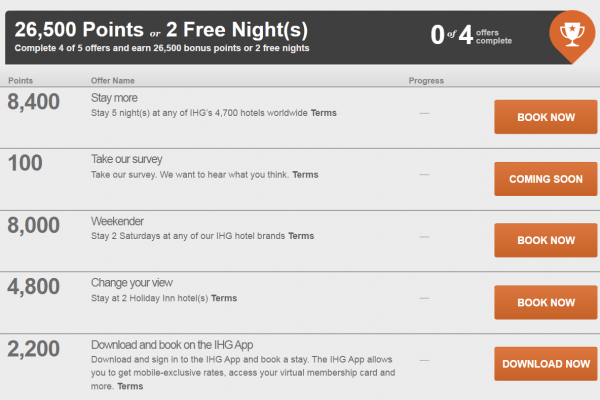 The difference is that you can now choose between 2 free nights or bonus points for reaching the goal. The registration is now open at this IHG web address. The previous ones that IHG gave us are still not resolving correctly. EDIT: Seems that the registration is not yet working for all. If this is the case, please try again later today. The form doesn’t allow you to sign up for an account and register it for the promo at the same time, as the country field that is required is missing from the form. Please post your personalized offer below (preferably a screenshot), your IHG Rewards Club status (Club, Gold, Platinum, Gold Ambassador, Platinum Ambassador or Royal Ambassador) and the number of qualified nights this year. This is is actually my personal offer. 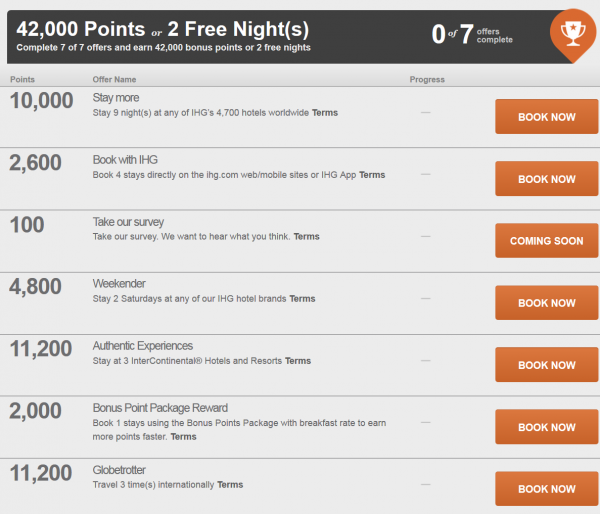 After completing 6 of the 7 hurdles, I could choose between 17,000 additional bonus points or 2 free nights. The bonus points versus 2 free nights ratio is more reasonable here. 42,000 bonus points for completing all the hurdles or 2 free nights. This would be an easy way to get the 2 free nights. You could complete it with just 3 stays. This member could get two free nights by staying at two different Indigo hotels internationally. Two Holiday Inn stays both on Saturday would yield the two free nights. Not Bad! As was the case with the previous Big Wins, the fewer stays you have had the easier the hurdles are. Those that got targeted for two free nights for just two or three stays should definitely do the promo even if they don’t usually stay at IHG hotels. The promotional terms and conditions are still missing. It is unclear what the validity of these free night awards is. Remember to post your targeted offer to the comment section below! You can even upload a screenshot.